Six miles southwest of Electric City, in the Upper Grand Coulee, stands the largest goat island in the Channeled Scablands: Steamboat Rock. The monolith rises about 700 feet above the coulee floor (Bjornstad, 2006). In its walls the history of the Columbia River Basalts that reached that far north is recorded. Not only the flood basalts contributed to this impressive structure, however. The sculpting influence of the Missoula Floods is mainly responsible for the shape of the coulee and Steamboat Rock as we see it today. 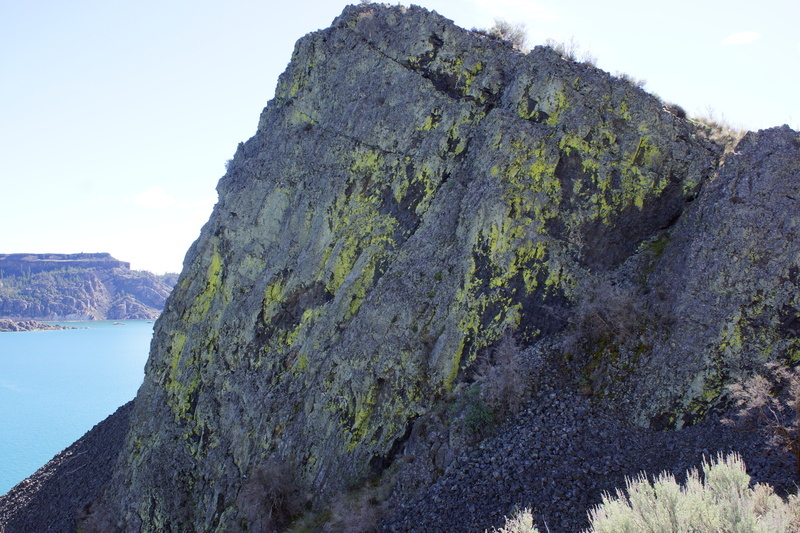 One particularly rare and interesting feature we see in the Upper Grand Coulee is giant slump blocks made of basalt. Anyone who has traveled the Channeled Scablands is familiar with the talus slopes that pile at the base of basalt cliffs. Normally basalt breaks down into angular rocks or sometimes irregular boulders—seldom does a piece over a thousand feet long come down all at once. Yet that’s exactly what happened at Steamboat Rock, and elsewhere in the Upper Grand Coulee, not just once, but at least half a dozen times. One large block at the northeast tip has been sampled and tested using x-ray fluorescence spectrometry to determine whether it came from the top layer of basalt that blankets the region, or from some lower elevation, such as a rock shelf or hanging coulee. Tests confirm that the top of the slump block is indeed made of the same Priest Rapids Member of the Wanapum Basalt as the top layer of the monolith (Evart, 2016). This means that it did indeed fall several hundred feet in one piece. To understand why these unusually large blocks fell so often in the Upper Grand Coulee, we first have to understand how it formed. When the ice age floods flowed over the area, they formed a giant waterfall called a cataract. So intense was the force of the floodwater going over the cataract, named Steamboat Falls by J Harlan Bretz, that it rapidly eroded backward toward the place where Grand Coulee Dam now stands. For a time, the falls split to either side of Steamboat Rock, until the cataract receded the rest of the way and breached the barrier separating what we now call the Upper and Lower Grand Coulees (Bretz, 1969). But what makes the Upper Grand Coulee different than other places carved by the floods? Many other coulees were carved by the floods, after all. First, location: so far north, hundreds of miles from the fissures that belched forth the Columbia River Basalts, the thickness of the lava flows is much thinner than other places. Second, the basement rocks: beneath the basalts the granite bedrock comes up almost to the surface in places. When the great floods carved the coulee, they could not cut through the resistant granite and were forced to cut outward, which is why the Upper Grand Coulee is miles wide in places and much narrower in others (Bjornstad, 2006). Why then did such immense blocks of basalt fall at once? Imagine the floodwaters rushing down the coulee, slamming into the basalt walls and plucking away rocks of immense weight. Columnar basalt is easier to strip away because the columns are not bound to each other, so very quickly the water cut beneath the more resistant layers. Once enough supporting columns had been ripped out, the resistant layer fell, perhaps even splashing into the rushing water! Visitors to Steamboat Rock will see at the northeast tip, the direction pointed directly up the channel, a massive slump block dropped by the last great flood to be carried by the Upper Grand Coulee. 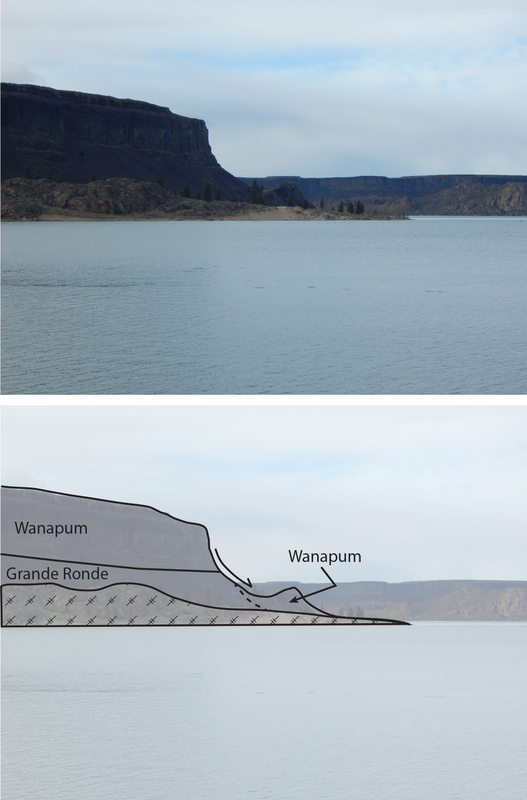 Untitled: Figure 1: What a geologist sees: Top, unaltered view of Steamboat Rock and the slump block. Bottom, annotated view highlighting the basalt layers and the direction of slump movement. View is looking north. 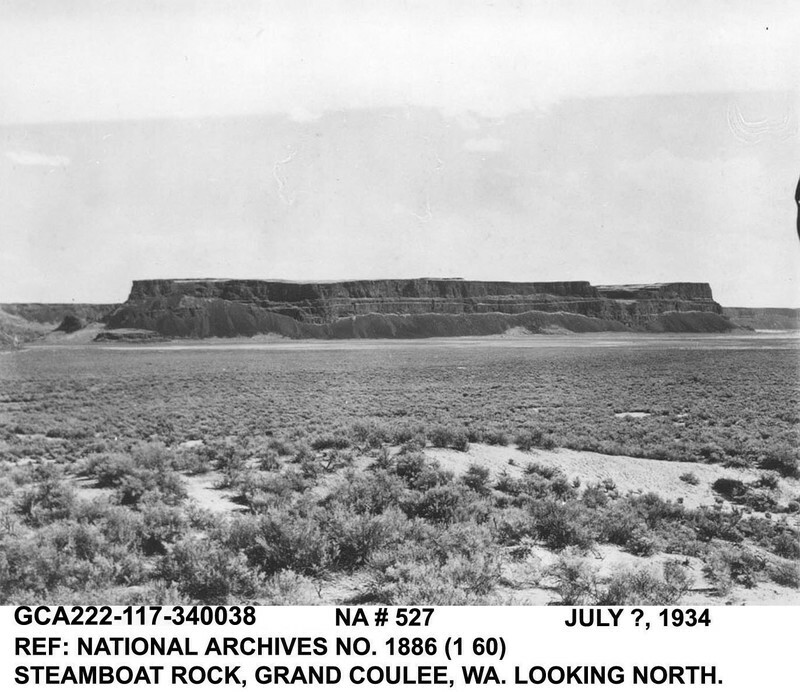 Untitled: Figure 2: View looking south from the north tip of Steamboat Rock or Goat Island, close-up of the slump block. 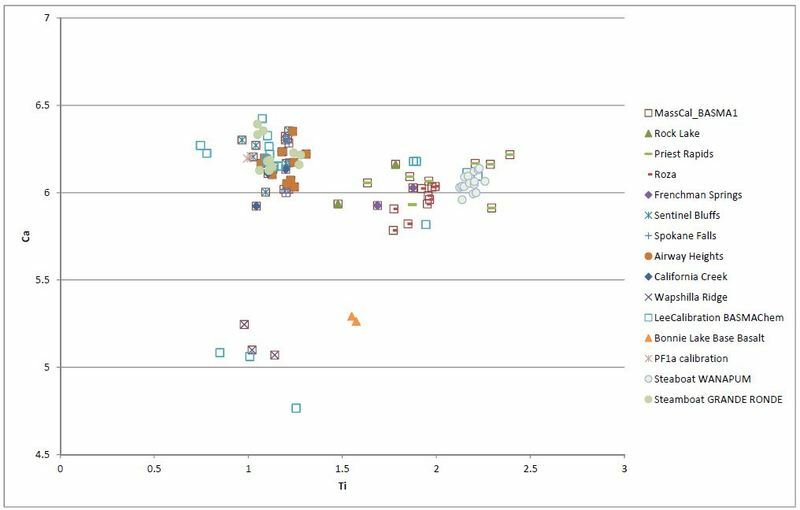 Calcium vs Ti (wt%) of selected basalt samples from different units within the Columbia River Basalt Group: This diagram shows that samples taken from the slide and the rock match chemistry and were therefore part of the same mass before the slide was activated. Lucas L. Evart, “Birth of a Goat . 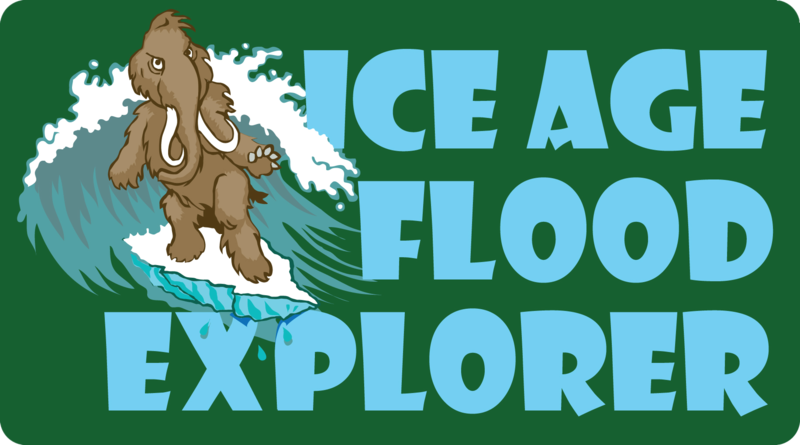 . . Island,” Ice Age Floods Explorer, accessed April 21, 2019, http://floodexplorer.org/items/show/59. Bjornstad, B.N., 2006, On the trail of the Ice Age floods : a geological field guide to the mid-Columbia basin: Sandpoint, Idaho, Sandpoint, Idaho : Keokee Books. Bretz, J.H., 1969, The Lake Missoula Floods and the Channeled Scabland: The Journal of Geology, v. 77, p. 505-543. Evart, L; Pritchard, C (2016) Geochemical and field identification of a landslide at Steamboat Rock, Washington using Portable X-ray fluorescence: Geological Society of America Abstracts with Programs, v. 48, No. 6.